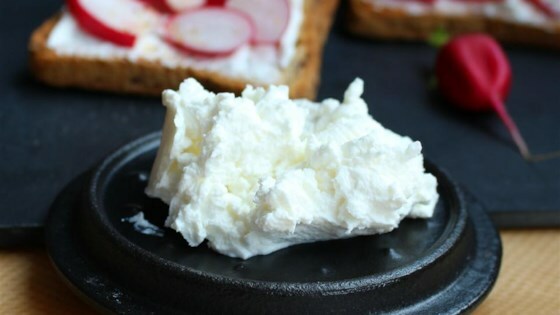 "This is a recipe for my Sicilian grandmother's creamy homemade ricotta cheese. Great as a spread on fresh bread or add as a topping to fresh Pasta." Line a large colander or sieve with 4 layers of cheesecloth. Set aside. Heat milk, buttermilk, heavy cream, and salt in a large, heavy, nonreactive saucepan over medium-low heat, stirring occasionally for the first 10 minutes. Continue heating, without stirring, until the temperature reaches 190 degrees F. Remove from heat and let stand for 1 hour. The mixture will be separated into white curds and clear whey. Using a slotted spoon, ladle approximately 1/4 of the curds into the cheesecloth-lined colander. Gather up the corners of the top cheesecloth and secure closed with a zip tie. Repeat with the rest of the curds, cheesecloth, and zip ties. Use the last zip tie to thread all of the cheeses together. Suspend the cheeses over a large wooden spoon over a large bowl, and let drain for 2 hours. Place the four cheeses, still in cloth, in a bowl in the refrigerator overnight. In the morning, cut zip ties, and transfer cheese to an airtight container. Wonderful! I am originally from Italy and find that the store bought ricotta often has a plastic container taste. I made this once and it was wonderful. Look forward to making it again.